The MNPV8HV-DISCO 3R's red handled is LOCKABLE IN THE OFF POSITION! Two RING TERMINAL 10-12 AWG. Description: MNPV8HV-DISCO 3R PV Disconnecting Combiner, 5 poles, 80 or 160 amp busbars depending on how they are configured. 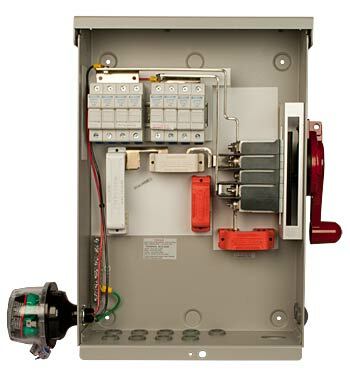 Switch is a 100 amp load break rated or 175 amps load break rated depending on configuration, 600 volt max.